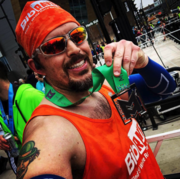 "The Milwaukee Marathon is Back (and Better than Ever!)" The 2019 incarnation of the Milwaukee Marathon (under new management and sponsorship) was an a great success in my opinion! After taking 2018 off from the race schedule and retooling a ton, they chose to have the race in April instead of the previous years' choice of October: smart move since early April is less busy race-wise than October. I ran the full marathon this time (2017 I ran the 10K and 2016 the half) and I really enjoyed myself; more than I expected to with this race. So, let's get to the meat of this review! Expo Quality: Packet pickup was really easy (I arrived around 1:30pm so the crowd was light) and was held the day before the race. It was held at the Fiserv Forum's (Milwaukee Bucks home, they were also a big sponsor) lobby area. You had to pick up on this day unless you chose to do day-of but that had an extra cost to it. The line was quick and the volunteers seemed to know that there must have been an issue with Wi-Fi and the Q-code since I couldn't get my e-mail to pop up but they were more than ready to just look up my name and get me on my way. The rest of the expo was kind of blah and I hope that future years have it become bigger and have more vendors. I know this year was kind of a make-good year for the event so hopefully this will change. There were booths for a local running store, Performance Running Outfitters, Supernola (a granola company), and a couple of other local races had booths set up. That was it. And the table for you to pick up your t-shirt (I will cover this in the Swag category). Parking Access: I found it simple, but more expensive than I liked. You could have signed up ahead of time for the parking lot near the start of the race. I did not do this but I also knew there would be plenty of parking all around the area and had no problem finding a spot. Course Scenery: The start of the race going through downtown was nice as was the early miles along the lakefront and back into downtown (only drag here was the day was dreary with no sun so a heavy fog was sitting all over the lake, not an exciting view, but there was one hell of an energetic spectator on a bridge cheering/roaring at all runners as they passed both times). After returning into downtown, for the full, you raced through Marquette University's campus and into the suburbs and neighborhoods of Milwaukee. There were some very quiet moments in this, the largest, stretch of the race but there were also plenty of pleasant surprises. The Washington Park area was full of boisterous people and there were other spots along the course where the neighbors busted out speakers or their cars for blaring music. Good positive energy at the right time. And then the end of the race had you finish back where you started at the Fiserv Forum where a ton of screaming fans and event staff were waiting for you. Aid Stations: All had water at one end of them and Nuun hydration at the other end, easy to decipher which was which as volunteers were consistently shouting what they had. At some stops there were Honey Stinger gels to consume if need be. I thought the variety of volunteers at the stations was incredible! From Marquette students to kids that looked like they might have been in 3rd or 4th grade and all in between, everyone did a fabulous job! Elevation Difficulty: There was one major hill in the early part of the race that was a winding path up to an area called the Water Tower along the lakefront. Of course, after going up that, you got to come back down on another hill. That wasn't so bad at that point. There was a subtle but long hill that took you out of the city (if running the full) that went up Wisconsin Avenue. Positive part of this hill was this is where you were returning for the end of the race, so that was nice. But the killers (for me) were these little up and downs that were consistent for a bunch of the race between miles 17-21. Nothing major but you were going up a little bit, then down a little bit, then back up, etc. My legs were not enjoying that very much. And then as you rounded the last turn of the race to the finish line, you had one more minor incline as you go across a city bridge. That's near mile 26 and I wasn't a fan of that, haha. T-Shirt/Swag: OK, bear with me on this. So, everyone gets a "Finisher" shirt at pickup (should be handed to you at the end of the race but whatever) and anyone who was running the half or full also received a 1/4 zip fleece. It's ok, nothing to write home about and not something I would run in. You receive a medal which isn't too bad, showing a silhouette of the city on part of it and the ribbon around it says what distance you ran. Also, at the finish, there was more water, Nuun, a banana, some Supernola granola, Honey Stinger waffles and you received a free beer too (Miller Lite or Coors Light). Now, something else you received and I must include it is with your medal, you could go into the nearby Good City Brewing spot and order what you wanted and get 20% off your bill. I thought that was pretty cool. Race Management: They did a phenomenal job, for the most part. They had a tough crowd to not only impress but convince to come back from the 2017 debacle. So, this race was more a test run than the real deal, I think. I had heard of a lot of people staying away to first see how this "new" race was going to go. Well, they nailed it and hopefully will be back even bigger and better next year. From the gear check (which was quick and well-run with plenty of volunteers) to the pre-race energy to the post race party which had music and Bango (Bucks mascot) riding around taking pics on his Segway, they had stuff figured out. The area for pre race/post race was a little cramped but next year there will easily be more space available once the old arena is taken down. I also would have liked to see a PR bell to ring somewhere (if there was one, I didn't see it or hear it) because many people, including myself, had great races and PR'd their distance. But overall, they did a great job with pre-race communication and how race day would shake out. They provided a list of 8 or 9 other parking lots to go to aside from the main one they were promoting. This race had a low bar, for sure, to get to due to 2017, but they catapulted themselves well above that bar to a point that this can become a preeminent race for Milwaukee and Wisconsin if they keep up this support and dedication for it. I highly recommend participating in it next year, at any distance. You won't be disappointed. "Run the Race, Eat the Pie!" The Great Milwaukee Pi Run was a race that I thought looked like a fun run, something to break my quiet streak of not running an actual race since January. I've also been looking for more 5K's to run in order for more opportunities to break my PR in the distance. (Full disclosure: I did not succeed with this race). The race takes place in a park with a botanical garden as the centerpiece (although that wasn't part of the course and it's winter) but it was nice to be away from the sounds of traffic and only the noise of other runners and nature. 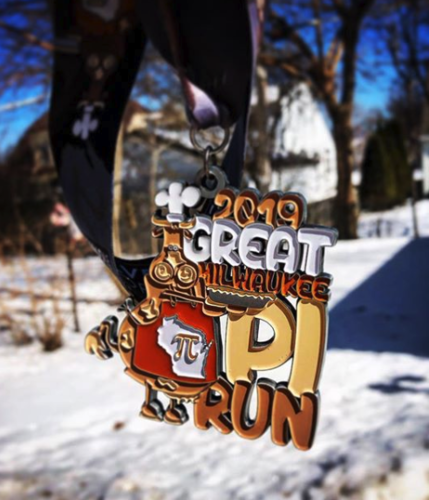 Let me tell you now about the pros and, unfortunately, some cons of the Great Milwaukee Pi Run. T-Shirt/Swag: Have to be honest, this race for the cost of it, does pretty well with the swag. You receive a race t-shirt that has a cute message referring to Pi. This year's colors were a fun maroon shirt and gold lettering. You also get a pretty sweet medal that shows a cow (not sure why) holding some pie. And to cap off the cups of water available at the end of the race (indoors, which was nice) you get your choice of a personal 4" apple or cherry pie! Aid Stations: There was one. Mid way through the course, which was good placement, sort of. Since the course had a point of out and back you passed the water station a second time, but it was only on the one side. So, great if you wanted water before hitting the 2 mile mark, but kind of out of luck if you wanted it on the way after the 2 mile marker. Course Scenery: Pretty nice. It's winter, so the trees are bare but the park itself was nice. There has been some crazy weather so there were some small patches on the course that had some ice but it was avoidable. Expo Quality: No expo and packet pickup was the morning of the race. I am not really a fan of that because it makes me feel like I need to rush to get there and check in and then attach the bib, etc. Elevation Difficulty: A rolling hills type course but the majority of those were small up and downs. EXCEPT, haha, the one hill heading up to the 2 mile marker. Whoa, was that a beast! The plus side of that hill was after getting to the top, you ran about 100 yards to turn around and head back. And was it ever great to scoot back DOWN that hill! Parking/Access: Easy access to a free parking lot right where the start line and packet pickup was. Race Management: I gave this three stars because I emailed the organizers twice questions that I had and never received any response. I thought that was irresponsible and unacceptable. I was disappointed and was angry. I will say the staff at the event were excellent and had a lot of energy. I can't think of the last time I was at a 5K race where at the finish there were multiple people (along with the emcee) not only cheering you on and encouraging you, but running along side of you to the finish if they thought you were struggling. That was top-notch! This is the fourth year I've run this race and this year had the best weather, by far! Sunny skies and upper 30s - low 40s temps made for a pleasant race. Afterwards though, the wind picked up a little bit and that made post race socializing last about as long as the free beer lasted, lol! And for the third straight year, I was able to lower my time, so that was pretty cool. The overall feeling I have about this race is that it is pretty good with great management, but it could be better. One of the biggest reason I run it (and best reason, really) is that it supports the MACC Fund, an organization that benefits children fighting cancer. Great cause to run for! Now I'll get into the rest of my review which will give the explanation why I give this race 4 stars and not five. T-shirts/Swag: You get a free cotton t-shirt which has looked the same for every year of the race. Ot needs a change; something, I don't know. But something to mix it up. The end of the race provides you with free coffee/hot chocolate, a local company's chips, water, banana and two free beer from Miller Lite (and, yes, you can choose green beer if you like), but that's all. And I consider post race food items to not really be swag. There's no medal. No glasses. They do hand out green beads as well as chocolate coins, but come on. This race needs a medal. It could be great! Aid stations: There is one water aid station on the course approximately in the middle of the course and that's appropriate for this distance. Course Scenery: I like it. Some of it takes place in a park; some of it on a main street in the city's village area; and the rest of it takes place through residential neighborhoods. The trees aren't in bloom yet obviously, but I still enjoy where we run. Expo Quality: Not much to write about here. I give it some stars because you pick up your packet at a local running store so there is opportunity to shop if you like, but otherwise that's it. Elevation Difficulty: This course has some slight inclines and declines throughout it and then one major incline you have to run up before circling around a bit and then heading down the same path on the way back, so that's nice. Parking/Access: Parking is easy as long as you know what you're doing, get there early and know the side streets where parking is simple and allowed. Race Management: They are great. Yes, they send a ton of reminders to sign up even after you have already signed up but they include plenty of updates to any possible changes in course or weather as well. They keep you up to date with the packet pickup and provide a cool countdown to race day. One last thing that I most assuredly should mention is the post race party. There is a DJ at the finish line blasting away and the emcee is full of energy as he yells out cheers for the finishers. Then, across the street is the main sponsor of the race, Leff's Lucky Town, a local restaurant/bar that invites all to come over and eat, drink and listen to a band set up in an outdoor tent. The after party is pretty fun to chill out and hang with friends. 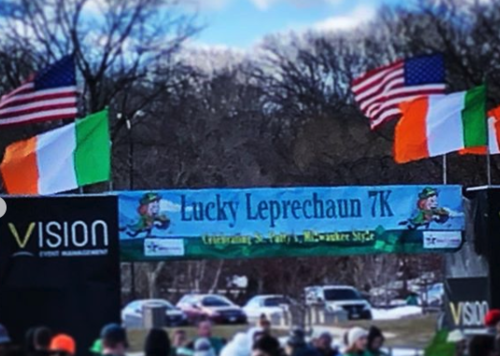 If you should be in the Milwaukee area around St. Patrick's Day I would suggest signing up for this fun run with a festive atmosphere. It is a good time! "2019 Samson Stomp n Romp 5K"
Another year of running the Samson Stomp n Romp 5K and another year where Mother Nature decided to show off who's the boss in winter time. Two weeks prior to this race, the temperatures were in the 40s and there was sunshine. The morning before the race, there was a snow storm that brought in 7 inches of snow and then a freeze blew into the area. Race start temperatures? 3 degrees. With a breeze. Ugh!! This year I had to give the race management a five star rating. Why? Sure, there were plenty of reminders to sign up for the race via e-mail and all social media channels as well as the necessary information for packet pickup. But more importantly, the zoo grounds crew staff had this course almost spotless for a hug stretch of it. If I didn't live nearby, I wouldn't have guessed that it had snowed so much the day before. Amazing work! Also, with your registration you received free parking and free access to the zoo for the day, so go run and then have some fun! I give five stars to the aid stations not because I needed to use it, but, because they were out there, offering water and cheering runners on. That is some incredible volunteer work. Standing, not running, around and cheering. Brave souls to do that in three degree weather. The swag was the customary t-shirt that they have every year but this year it was a bit underwhelming with a weak front design and nothing on the back. The gorilla overall and age-place awards are cool (my yet to be achieved goal) but not everyone gets one of those so I can't include that in my opinion of the swag. Nothing for the expo because there isn't one; just packet pickup. The course scenery was fun as usual but was a little sparse compared to normal. 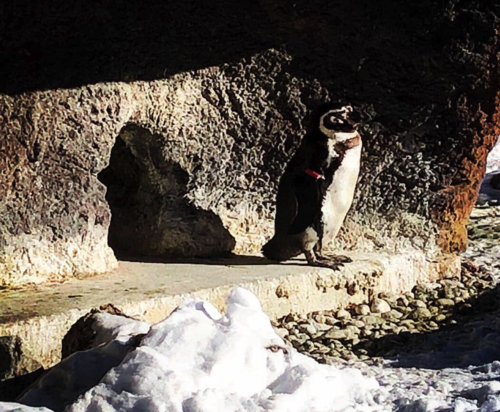 I imagine the ice cold temps kept some of the animals inside, but there were still enough of them outside to look at while running by. Also, this course, for just being a 5K, always challenges me with the various elevation changes from going up to down and then the finish which goes uphill as well. A challenge that is always fun to take on. All in all, it was another chilly Samson Stomp but I will crazily be back next year, I am sure. I mean, I need another chance to get one of those gorilla trophies! "Another Dash in the Books!" Another Thanksgiving morning, another Drumstick Dash 5K in Milwaukee! 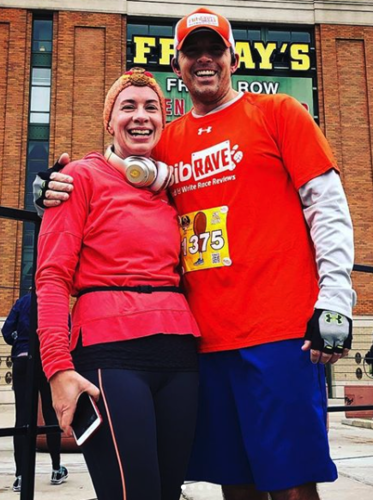 Even though it's usually windy or bitterly cold, I do enjoy this race and the fact it supports Feeding America, an organization that helps provide food for people who may not be able to afford it. Like the race motto says, "Move your feet so others can eat!" Bonus this year for folks who didn't want to run a full 5K was the addition of the Half a Drumstick 2K. Swag: Each year of this race they have always provided a long sleeve t-shirt, until this year. This year they went with a thin layered hoodie. I have to say that I have loved the t-shirts but the hoodie is a nice change of pace. The swag area though is why I don't give this race a full five stars. I really wish they would provide a medal. I see so many other Turkey Day races giving medals, why can't this one? Aid Stations: They provide one halfway through with water, which is plenty. It's easily accessible as you run by and the volunteers are awesome and there are a lot of them there ready to hand you a cup. Course Scenery: Always a fun race as you run around Miller Park and the surrounding neighborhood and then across the pedestrian bridge that connects the parking lots to the stadium. Expo Quality: Small. It is located in the club lounge at Miller Park. There is packet pickup, obviously. There are a few cutouts to take pictures with and a couple of vendors. There was another Vision Management race set up to sign up for if you wanted to. Also a table for last minute registration was available. Elevation: There is one substantial hill at the start. After that there are some rolling areas with small ups and downs. The final push to the finish line also as a decent incline. Parking: Free! Miller Park parking lots are open for all cars, racers or just viewers. Race Management: They do a great job with email updates and on Facebook/Instagram as well. No way you miss any information as they post often as race day gets closer.